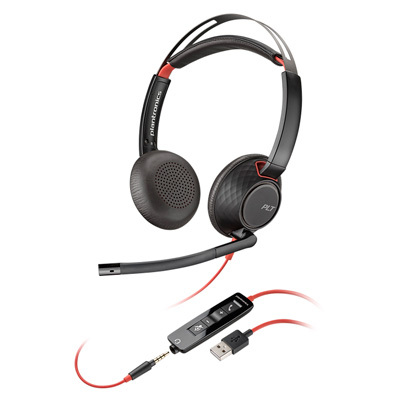 A new USB cable for CS500 series wireless headsets will begin shipping in December 2015: Plantronics APU-75 (PN 202678-01) MSRP $79.95. Now managing softphone calls is possible with CS500/CS500 XD series wireless headsets. We consider this a breakthrough and the announcement came as a surprise to us at BTP. Â The cable will help customers who have large installations of CS500 series save significant cost on headsets when migrating to softphones. How willÂ this cable benefit you? Do you have CS500 series wireless headsetsÂ deployed? Are you planning on migrating to softphones? If your answer is yes to both, this cable will save you from having to purchase new wireless headsets for softphones. The big end of the cable plugs into the back of theÂ CS500 series headset charging base, and the USB end goes to the PC. Â Now you can hearÂ softphone calls! You will need Plantronics Hub software (a free download) to manage softphone calls except with Microsoft Skype for Business. You do not need Hub for SfB. Another benefit is when the cable is usedÂ withÂ CS500-XD series, softphone users can operateÂ in a 900 MHz extreme density environment. Â That means you can mix in XD series wireless headsets with DECT (Savi W700 series wireless headsets) and significantly increase the number of people in a work area onÂ wireless headsets without interference. PleaseÂ note the APU-75 cable takes the place of the telephone interface cableÂ which connects the wireless headset base to the landline desk phone. You cannot switch back and forth from desk phone to softphone with the press of a button, like you can with Savi Series wireless headsets. If you wanted to use your headset to talk on the desk phone, you’d have to unplug the USB cable and connect your old cable again (the telephone interface cable). FinallyÂ APU-75 is also compatible with Mitel 6867 and Mitel 6869 HID1 desk phonesÂ which have a USB headset port.Â These are Mitel’s advanced SIP phones for the power user. You can connect yourÂ existing CS500 series with APU-75 cable to these phones. Now managing softphone calls is possible with CS500/CS500 XD Series.Â The APU-75 cable is expected to start shipping December 1, 2015. Order from BTP now for earliest delivery. « Previous: All gave some. Some gave all.